The US Department of Commerce has again ruled against aerospace firm Bombardier in its dispute with rival Boeing. 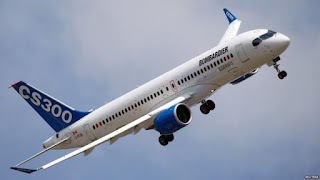 A further tariff of 80% has been imposed on the import of Bombardier's C-Series jet to the US for alleged below-cost selling. This is on top of an earlier tariff of 220% which related to subsidies Bombardier got from Canada and the UK. There have been warnings that the import tariffs could threaten Bombardier jobs in Belfast. About 1,000 jobs are linked to the C-Series, the wings of which are made at a purpose-built £520m factory in the city. A spokesperson for Bombardier said: "We strongly disagree with the commerce department's preliminary decision." The firm said the ruling represented an "egregious overreach and misapplication of U.S. trade laws". "The commerce department's approach throughout this investigation has completely ignored aerospace industry realities," it said. "This hypocrisy is appalling, and it should be deeply troubling to any importer of large, complex, and highly engineered products."